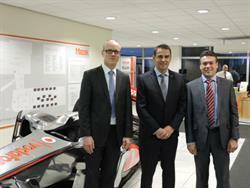 McLaren Mercedes has further extended its contract with Yamazaki Mazak. The agreement ensures that Mazak continues in its role as the sole Official Supplier of CNC machine tools to the McLaren Mercedes Formula One team. Mazak has supplied the team since 1999 and currently has a total of 25 machines installed at the McLaren Technology Centre in Surrey, including multi-tasking and multi-axis machines from the INTEGREX and VARIAXIS series. This latest contract extension will see a number of additional new machines installed as the team continues its drive to increase performance and productivity in manufacturing operations. Since starting the partnership with Mazak in 1999, the team has won two world championships, 62 grand prix and accumulated a total of 2,619 Championship points and Mazak machines have proven invaluable in contributing to this success. From the immense cutting power of the VORTEX 815/120 to the ultra-high feed rates of two HYPER VARIAXIS 630, McLaren’s Mazak machines are reducing cycle times, increasing tool life and improving the quality of finished parts to enable the team to make even thinner and lighter components.